There’s a notebook in Lindsey Spann’s bedroom. In it are all of the goals that she sets for herself as a student-athlete. Sometimes the redshirt sophomore guard achieves them, other times she does not, but every year, Spann sits down and lists what she wants to accomplish. What are these goals? Not many people know, as she has limited the number of people who are aware of them ever since she began this exercise as a high schooler. Whatever they were, this list of goals helped motivate Spann to a breakout year in 2014. Spann’s career in the blue and white got off to a rocky start. In her first practice as a true freshman in 2013, the Maryland native tore her ACL, which sidelined her for the year. Spann sat and watched as the Lady Lions went 24-8, won the Big Ten, and made their second Sweet Sixteen in three years. But while the team was excelling on the court, Spann was working in the weight room. 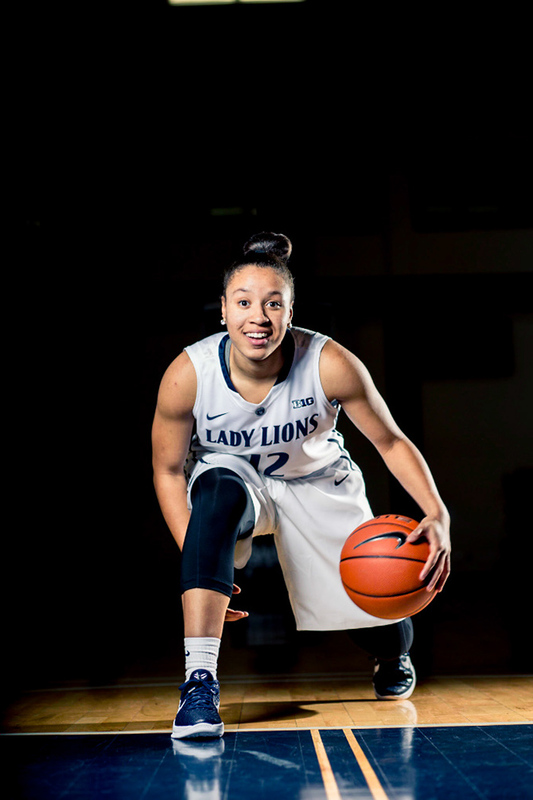 She spent the entire year rehabilitating her knee and made such a positive impression that at season’s end she received the Robin Lombard Award, given to players who possess “qualities that exemplify the true spirit of Lady Lion basketball.” Spann’s hard work off the court led to additional recognition from the coaching staff – she was named one of the team’s tri-captains for the 2014-15 season, which for a redshirt freshman is quite the accomplishment. “It is something you don’t see a lot, but (coach) Coquese (Washington) trusted me with that role and I feel like having that role last year really prepared me to be a leader throughout life and with this team,” Spann said. From the start of last season, Spann established herself as the squad’s go-to scorer. Her team-high 13.2 points per game made her the fifth freshman to lead the team in scoring since 1980, and the first since Maggie Lucas in 2010-11. Spann’s success doesn’t just occur on the hardwood: the communications major was an Academic All-Big Ten honoree in 2014, and she’s a member of Penn State’s Athletic Director’s Institute of Leadership. Now, with the season around the corner, Spann has a brand new list of goals. Like always, these goals will encompass her entire life. And like always, these goals will be kept close to the Lady Lions’ star’s heart. The Lady Lions’ 2015-16 season kicks off on Friday, Nov. 13, when the team hosts Holy Cross at the Bryce Jordan Center. The game is scheduled to tip off at 7 p.m. Entry filed under: The Penn Stater Magazine. Tags: Lady Lions, Lindsey Spann.